Experience Nashville's nightlife come alive on this sightseeing tour! Aboard a comfortable coach with your guide, pass famous landmarks like LP Field, the Ryman Auditorium and the Parthenon in Centennial Park, all beautifully lit up at night. Enjoy a Southern barbeque dinner and have free time to stroll down Honky Tonk Row, full of a variety of clubs and live music venues. Start your evening with hotel pickup and head to a local restaurant for a Southern barbeque dinner. Then, soak up the beauty of this historic city with a sightseeing coach tour with your guide. Pass sites like LP Field, home to the Tennessee Titans; the Ryman Auditorium, the former home of the Grand Ole Opry; and the Parthenon in Centennial Park, which looks just like the one in Athens. 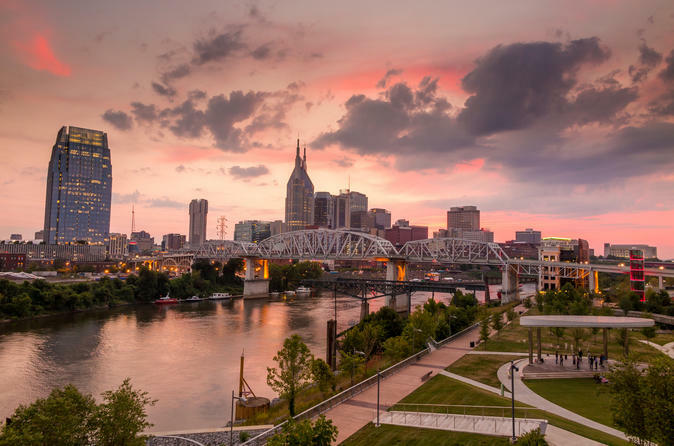 See Historic Riverfront Park, the Schermerhorn Symphony Hall, the State Capitol and the Country Music Hall of Fame, whose windows mirror the configuration of piano keys. As you drive, enjoy great views of the city sparkling against the night sky. Then, enjoy free time in downtown Nashville to check out the nightlife scene and enjoy live music along Honky Tonk Row, offering several lively clubs and venues to suit a variety of tastes. Stop by Tootsie’s, Orchid Lounge, Legends Corner and more. At the end of the night, you’ll be taken back to your hotel.